Separation anxiety in dogs is a tragic disorder affecting the lives of millions of dogs and the people who love them. Fortunately, it can be successfully treated. Due to the unique nature of separation anxiety and it’s treatment protocols, we can work with dogs and owners suffering from this disorder anywhere in the United States via Skype or other similar technology. Coming home to complaints that he’s been barking all day? Finding doors, windows, furniture, or other items destroyed? Vets visits for wounds caused by anxious licking or chewing? The stress of knowing your dog is anxious and unhappy without you? It doesn’t have to be like this. We can teach your dog to enjoy being home alone. Separation anxiety is a common anxiety disorder among dogs. It can be triggered by re-homing, changes in the household composition (such as key people in the dog’s life moving out), moving, or traumatic experiences. Separation anxiety worsens over time without treatment. Treating the condition requires time and patience, but the results are well worth it. Just imagine coming home to a dog who’s been happily snoozing all day instead of tearing up your house—and your heart—in a panic attack. Once we receive your completed questionnaire, we’ll contact you to set up a 30 minute complementary phone consult to discuss your case and determine how we can work together. You’ll meet with a trainer with special separation anxiety credentials who will evaluate your dog’s case severity, talk with you about your goals, help you understand why your dog is reacting the way he is, and explain the process for treating separation anxiety. Your separation anxiety expert trainer will create a treatment plan customized to your dog’s case and your lifestyle, and then she’ll be there to support you every step of the way. Go to work knowing there will be no surprises waiting at the end of the day. Enjoy dinner or a movie out without guilt. Run errands without having to take your dog along. In short, enjoy life with your dog anxiety-free for you both. Click and fill out our Initial Client Questionnaire to get started! "The peace of mind we have knowing that Bentley is relaxed when we are away is invaluable. We cannot express enough gratitude for the help she gave us." 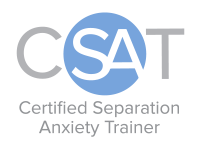 Lisa and Tiffany have earned their Certified Separation Anxiety Trainer (CSAT) credentials, giving them the highest qualification available to treat this heart-breaking disorder. 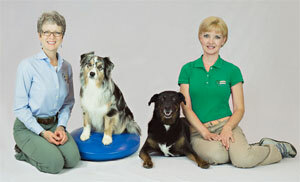 Only a small number of highly experienced trainers are accepted into this program each year. Learn more about Lisa & Tiffany and their professional training credentials. "Tiffany guided us through a seemingly impassable journey of desensitizing our pup, Rufus, from his separation anxiety. She listened to our concerns and recognized when we were feeling discouraged and was always there to bolster us." We take great pride in staying up-to-date on the most recent scientific understanding of dogs and dog behavior, and the most efficient and effective training techniques. That means we use only humane, dog and human friendly training approaches. We want you to feel great about the results you get and how you get them.